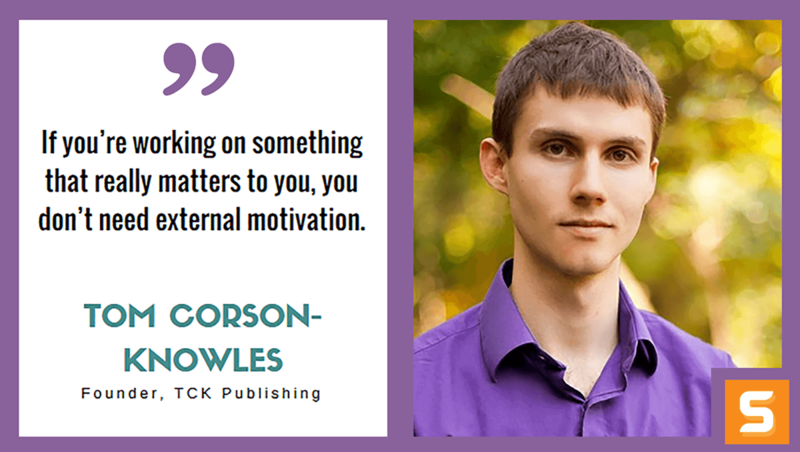 Tom Corson-Knowles is a serial entrepreneur, blogger and international bestselling author. He is also the founder of TCK Publishing, an international trade book publisher that is leading the industry in providing advanced marketing support for authors. Tom started his first business at age 13, manufacturing SAD lamps out of his father’s garage. By the time he graduated from Indiana University Kelley School of Business at age 22, he was earning a full-time income from his first successful business which he started in his dorm room. Tom then decided to share the keys to success that he had learned along his journey to becoming a financially independent entrepreneur through his books, videos, and seminars. Today, he teaches new and established authors and writers how to achieve incredible success by writing and selling ebooks on Amazon Kindle. Tom is the founder of EbookPublishingSchool.com, a free video training program for any author who wants to learn how to successfully write, publish, and market their own ebooks. In this interview with Startup Savant, Tom shares his experiences with self-publishing and how he loves sharing his experience with others. If you want to know how to become the next best-selling author, be sure to follow Tom on Twitter! Find out what your customers want, go get it and give it to them! What motivated you to start TCKPublishing? How did the idea come about? It took me six years of banging my head against the wall trying to get my first book traditionally published and failing miserably until I finally decided to self publish. Within a year, I was earning more royalties from my eBooks on Amazon Kindle than I ever dreamed possible. It was my dream come true! And it all happened because I uploaded a little word document of my manuscript on Amazon and then figured out how to make my books better and educate my readers. I just naturally love to learn and share good ideas, so I started teaching some friends and colleagues how to write and publish their books based on what I had done and the lessons I learned along the way. That led to me creating a video training course on Udemy where I teach other people how to write, publish and market their books. A lot of those students kept asking me if I could just publish their books for them, so I decided to test it out and see if it would work and that’s how TCK Publishing began. What is unique about your publishing business? Is there a competitive advantage that you have over the rest? There are a lot of things we do that are unique. We pay our clients 50% royalties instead of the traditional 8-15% other publishers pay. We’re able to pay so much more because the industry economics have changed so much in the past decade, and the big publishers aren’t keeping up with the changes. We also really value our authors and we want them to be earning a full-time income from their royalties so they don’t have to work a job they hate and can instead focus on writing more books. It has been very disappointing for me to see all the traditionally published authors who look successful because they have best selling books, but they still have to work a full-time job just to put food on the table. I never wanted our clients to end up like that. We also help coach our clients on how to build their author platform and following using their own unique skills and talents. Some clients are great speakers and love to do interviews and public speaking, so we help them learn how to succeed with those skills. Since I’ve done hundreds of interviews on all kinds of media, I can share with them the strategies I used and help them get started on the right track so they’re not wasting time reinventing the wheel. Other clients are shy and hate public speaking but love to write, so we help them set up an author website and blog where they can create valuable content for their audience and become the leader in their field online. In my experience, the great marketing for authors that works long-term is all about finding your unique strengths and skills and using them in a way that shares your message and story and helps your audience. Another thing that makes us unique is that, with only a few exceptions, we don’t do one-book deals. We’re looking to create long-term relationships with our clients and help them publish multiple books so they can build stable brand and platform that will last for many, many years. Even though our publishing contract term is only for 5 years, we want to work with our clients for life and continue to help them grow their business in the publishing world and beyond. The only exception to this rule is for clients who are experts in their field and have one unique message to share in their book, like Dr. Véronique Desaulniers and her life-changing book Heal Breast Cancer Naturally. We also publish books in all major fiction genres and non-fiction markets. Although this is not unique, I believe it gives us an edge on publishers who only publish in one single market because it helps us better educate our authors about the various markets and genres, the changes that are happening across the entire industry, and how those changes may affect the author. Because we can provide our authors with more information, they can make better decisions as to how they approach their career. Yes, we’ve had several disappointed clients. Usually this happened because a client expected certain results in a certain time frame and became disappointed when they didn’t get what they expected. Today, we have a more detailed conversation with new clients where we specifically talk about their expectations, what is reasonable to expect, and what the results are like for the “average” author. It was shocking to me but a lot of authors just think if they get a book published they will become millionaires overnight without doing any work, and that’s just not how the world works for 99.99% of authors. We have a special guarantee for all new clients where we guarantee if their book does not become a best seller in at least one category on Amazon within the first year we will pay them $1,000 in cash in addition to their earned royalties, and they can cancel the contract. So far, no one has claimed the guarantee reward because their books have become best sellers. I love to learn and I strive to keep learning new things and evolve what I do and how I do it. Everything I know today I learned along the way whether from experience or a book or another person. I’m always open to learning new things and keep growing, so that’s what I have done and this one habit has served me very well. I’m also stubbornly persistent. I keep working and plodding along in the right direction because I know the path I’m on is worth pursuing. Even if I never reach my next set of goals, I know that the journey will be worth it because of the fulfillment I get from my work and the personal growth it helps me experience. Time is always an issue. We all have just 24 hours each day to live our life and get our work done. I try to stay focused on doing my most important work each day. If I can do the most important tasks each day, then I’ve done my best and there’s nothing else to ask for. I see a lot of people who are busy, busy, busy but not getting anywhere and I think it’s almost always because they don’t prioritize. They don’t know what’s REALLY important to them, so they just do whatever task shows up on their desk. That’s ineffective and that’s how you waste time being busy but not getting anything important done. For money, I try to be as frugal as possible. I don’t invest money in the business unless there’s a good reason. I don’t have a fancy office or expensive furniture. We just don’t need those things. I try to stay focused on what is most important and spend my money and the company’s money accordingly. There’s always enough money to spend on what’s truly important. It’s when you start spending money on what is NOT important that you get into really big financial trouble. What are some of the biggest obstacles that you have encountered as an entrepreneur? Myself. I’m my own worst enemy. Every day I have to work on myself, question my own beliefs and expectations, and make sure I’m not getting in my own way. Life becomes a whole lot easier when you realize that you are in complete control of what you choose to do, and that what you choose to do is what will determine your future results. Once you understand that, the only thing you need to do is get to work and be patient, knowing that if you do the right work, you will get the right results. I used to study motivation and think a lot about it and how to get myself motivated, but now I don’t think about it at all. I just try to focus on what’s important to me and what my values are. If there’s work to be done that aligns with my values, I do it. If there’s work I think I should do or could do that doesn’t align with my values, I don’t do it. If you’re doing work you love and you’re doing it in the right way, with the right method and the right mindset, you will be rewarded with far more than just money. I find my work itself very rewarding, so I find that I don’t need external motivation to keep going. When you wake up excited to get to work, what good is motivation? Instead of trying to get motivated, try to find meaning in what you do. If you’re working on something that really matters to you, you don’t need external motivation. You’ll have found internal inspiration, which, in my experience, is infinitely more powerful. Is there a type of marketing that has worked amazingly for TCKPublishing? If so, how did you stumble upon it? Education. I believe all great marketing is simply great education. That’s why I have created hundreds of free training videos for authors on my YouTube channel, that’s why I created the Publishing Profits Podcast (which has no ads or sponsors, so it’s just great free education for authors), and that’s why I publish helpful articles, checklists and resources regularly at TCKPublishing.com. If you have a great, unique product or service and you educate your customers well, it becomes a no-brainer for them to do business with you. Where do you see TCKPublishing in the next 5 years? Any new products/services in development? I see us publishing great books that make a difference and make an impact. We’re striving for meaning, not just money. It sounds cliché and maybe it is, but it’s what we believe in – that the work we do matters, that authors matter, that books can change how people think and feel and behave, and that the ripple effects of those changes can improve the world in ways we can’t even comprehend. As for new services, we’re looking to expand into distributing books into libraries and bookstores, doing more foreign language rights deals, licensing deals, creating a bulk sales program for our books and hopefully getting some of our books turned into movies as well. It sounds like a lot, but when you have a great team who knows what they’re doing, it becomes easier to accomplish more. What are the three best pieces of advice that you would give to anyone starting a business in Indiana? What do they need to know from the very beginning? 1.) Find out what your customers want. Really do your research. Ask people, post surveys, ask other business owners in your market. Do everything you can to find out exactly what your customers want. Once you find out what your customers want, you need to find a way to build what they want in the best, most effective, most financially reasonable way possible. Most entrepreneurs mix up the steps. They build the product or service and hope their customers will want it. Many people do that, and it’s okay as long as you learn from your mistakes and make changes, but it’s a whole lot easier if you do step 1 first. 3.) Give it to them. Once you know what your customers want and you have build the product or service they want, you have to give it to them. You have to have the distribution and the marketing. You have to make it convenient. You have to educate people so they know enough to know why your product or service is better or different than anything else they’ve heard of before.